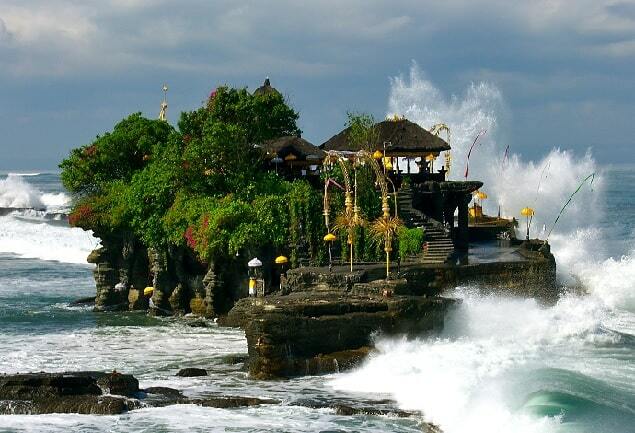 "One of the most popular temples in Bali is Tanah Lot (�Land in the Sea�). This temple is built on a rock formation that juts off from Bali. It is said that a Hindu religious figure in Bali, Danghyang Nirartha, instructed fishermen to construct this temple as a holy place for worshipping the sea god. Arriving early is the best way to avoid the crowds and visit the temple in a quiet seaside setting." The Tanah Lot temple is located at the west coast of Bali on top of a large rock in the sea. The name literally means Earth (Tanah) and sea (Lot). The temple is about 20 kilometres from the capital Denpasar. The temple is separated by the long tide from the ocean and the land. This temple is only accessible during low tide. At the foot of the temple you can see the white surf and black sand. At high tide, waves flood the causeways making it impossible to cross. At low tide, you may cross to view the rock base where the legendary �guardian� sea snakes dwell in crevices around the Tirta Pabersihan fountain. Tanah Lot is claimed that the founder of this temple is the 16th-century priest Nirartha. During his travels along the south coast he saw the beautiful surroundings of the rocky island and he rested there in his journey. Some fishermen saw him, and brought him gifts. Nirartha then spent the night on the little island. Later he spoke to the fishermen and told them to build a shrine on the rock for he felt it was a sacred place to worship the Balinese sea gods. This persuaded the Balinese people to build the Tanah Lot temple at the same place. The story goes, that there was once a bridge from the mainland to the temple, but it was destroyed by the sea. Remarkable is, that the 'cave' has a magical source. 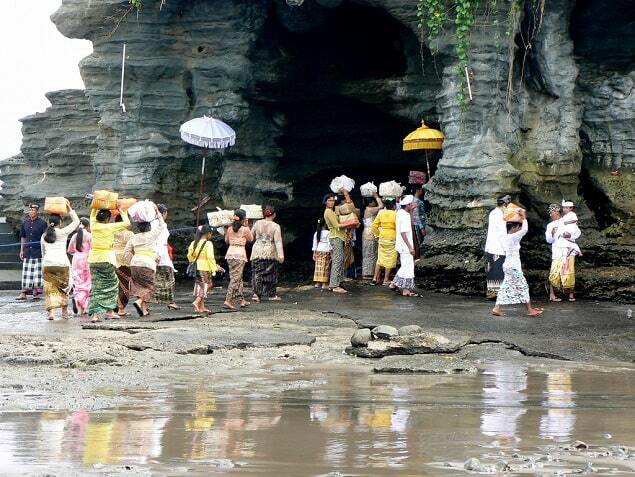 From this source comes freshwater, while the temple is located in the salty sea. The temple is one of seven sea temples around the Balinese coast. Each of the sea temples would be in sight distance from each other and should form as a chain along the south west coast. At the foot of the rocky island is believed, that there are poisonous sea snakes, to guard the temple from evil spirits and intruders. In the Balinese mythology, a giant snake also protects the temple. This snake is made from a towel Nirartha, when he had settled on the island. In 1980, the rock wall of the temple began to crumble and the area around and inside the temple was too dangerous for visitors. The Japanese government provided a loan to the Government of Indonesia to renovate the historic temple and other major attractions in Bali. The result is, that more than one third of Tanah Lot "rock" are actually cleverly shaped, artificial rocks. These art rocks were therefore financed and supervised by the Japanese during the renovation. 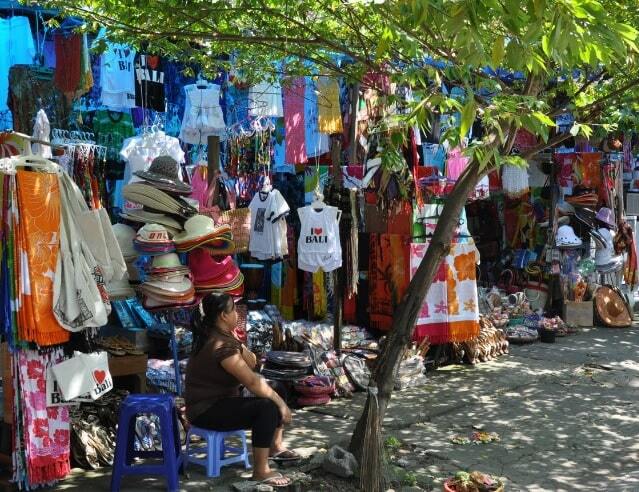 The area around Tanah Lot is highly commercialized and touristy. The visitors have to pay to enter the area. To come close to the temple, visitors must walk through a kind of market street. On the left and right side of the path that leads down to the sea, are Balinese souvenir shops selling handicrafts in all sizes. On the cliffs on the mainland are restaurants for tourists to eat and drink. You have to walk a little bit, you can not come close to the temple by up car. The walk is very tiring. Tanah Lot attracts many tourists. You can best see the temple in the late afternoon when the temple creates a ghostly silhouette against the sunset. It is a major tourist fairground attraction and at both side of the access road it's very tourist, but if you have early morning comes, than it's quiet and you can really enjoy this beautiful temple.